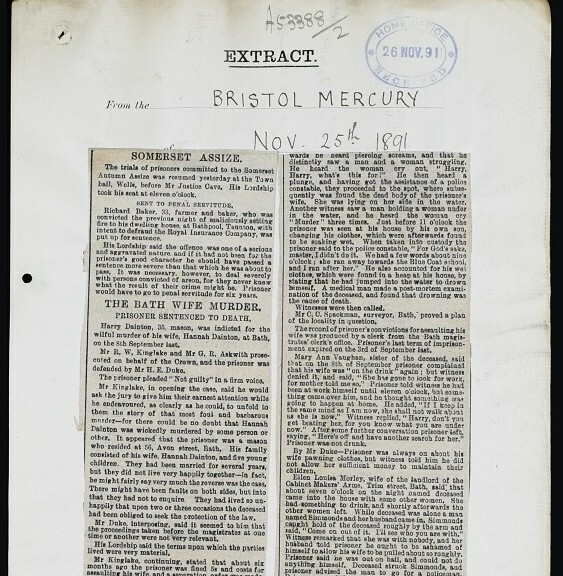 THE BATH WIFE MURDER PRISONER SENTENCED TO DEATH – BRISTOL MERCURY (EXTRACT) NOV 25TH 1891 | Don't mention the M word! Harry Dainton, 35, Mason, was indicted for the wilful murder of his wife, Hannah Dainton, at Bath, on the 8th September last. Mr R. W. Kingslake and Mr G. R. Askwith prosecuted on behalf of the Crown, and the prisoner was defended by Mr H. E. Duke. The prisoner pleaded “Not guilty” in a clear voice. Mr Kingslake, in opening the case, said he would ask the jury to give him their earnest attention while he endeavoured, as clearly as he could, to unfold to them the story of that most foul and barbarous murder – for there could be no doubt that Hannah Dainton was wickedly murdered by some person or other. It appeared that the prisoner was a mason who resided at 56, Avon Street, Bath, His family consisted of his wife, Hannah Dainton, and five young children. They had been married for several years, but they did not live very happily together – in fact, he might fairly say very much the reverse was the case. There might have been some faults on both sides, but into that they had not to enquire. They had lived so unhappily that upon two or three occasions the deceased had been obliged to seek the protection of the law. Mr Duke, interposing, said it seemed to him that the proceedings taken before the magistrates at one time or another were not very relevant. His Lordship said the terms upon which the parties lived were very material. Mr Kingslake, continuing, stated that about six months ago the prisoner was fined 5s and costs for assaulting his wife, and a separation order was made. Again on the 20th of August he was sent to gaol for 14 days for assaults upon his wife, the term expiring on the 3rd September. The murder with which they had to deal occurred on the 8th Sept, so that at that time the prisoner had been out of gaol only five days. His wife said to him “If thea’s threaten me, I shall have thee bottled,” meaning, he presumed that she would have him taken into custody. They went into the Lord Nelson together, and subsequently the deceased woman went home, and the prisoner returned to his work. Between seven and half-past seven that evening, the deceased and another woman went into the Cabinet Makers’ Arms, and soon afterwards the prisoner and Simmonds followed them there. During the evening the prisoner and his wife seemed to have had a quarrel and the woman was found streaming with blood. She said her husband had struck her but he denied it. They left the Cabinet Makers’ Arms at a quarter to ten o’clock, and from that time until the woman was seen in the river no human being saw her sufficiently near to identify her. An important witness, Maber, did, however, state that he saw the prisoner dragging a woman down the steps at Kingmead Terrace, leading to the river. He heard the woman say “You serve me too wicked.” He saw the go onto the tideway path, he heard piercing screams, and that he distinctly saw a man and a woman struggling. He heard the woman cry out “Harry, Harry, what’s this for?” He then heard a plunge, and having got the assistance of a police constable, they proceeded to the spot, where subsequently was found the dead body of the prisoner’s wife. She was lying on her side in the water. Another witness saw a man holding a woman under in the water, and he heard the woman cry “Murder” three times. Just before 11 o’clock the prisoner was seen at his house by his own son, changing his clothes, which were afterwards found to be soaking wet. When taken into custody the prisoner said to the police constable “For God’s sake, master, I didn’t do it. We had a few words about nine o’clock; she ran away towards the Blue Coat school, and I ran after her.” He also accounted for his wet clothes, which were found in a heap at his house, by stating that he had jumped into the water to drown himself. A medical man made a post-mortem examination of the deceased, and found that drowning was the cause of death. Mr C. C. Spackman, surveyor, Bath, proved a plan of the locality in question. The record of the prisoner’s convictions for assaulting his wife was produced by a clerk from the Bath magistrates’ clerk’s office. Prisoner’s last term of imprisonment expired on the 3rd of September last. Witness replied, “Harry, don’t you go beating her for you know what you are under now.” After some further conversation prisoner left, saying “Here’s off and have another search for her.” Prisoner was not drunk. By Mr Duke – Prisoner was always on about his wife pawning clothes, but witness told him he did not allow her sufficient money to maintain their children. Ellen Louisa Morley, wife of the landlord of the Cabinet Makers’ Arms, Trim Street, Bath, said that about seven o’clock on the night named deceased came into the house with some other woman. She had something to drink, and shortly afterwards the other woman left. Witness remarked that she was with nobody and her husband told the prisoner he ought to be ashamed of himself to allow his wife to be pulled so roughly. Prisoner said he was out on bail and could not do anything himself. Deceased struck Simmonds and prisoner advised the man to go for a policeman. He accused the woman of pawning their boy’s clothes, and she retorted that she had done it for food. Prisoner said he had not been doing much work lately. Shortly afterwards the witness went into another room, and while there she heard a “rumpus.” She returned to the apartment in which she had left prisoner and his wife and found that blood was streaming down the woman’s face. Prisoner denied having struck his wife, but she said he was telling lies. They had some gingerbeer between them, prisoner saying they would be allright after that. Deceased was wearing a black dress, and prisoner had on a pair of corduroy trousers and a dark coat, with bowler hat. The articles produced at the magistrates’ hearing were the same. Prisoner returned to his work about an hour afterwards. Witness met him in the evening between 6 and 7 o’clock, and they walked about the town together. About eight o’clock they went into the Cabinet Makers’ Arms. Deceased was there, but witness did not touch her as far as he could remember. Prisoner and his wife had a few words, and witness left the house. Mr William Edwin Maber, of 10, Kingsmead terrace, spoke to seeing a man and a woman in the terrace. He identified prisoner as the man; he could see his face distinctly. Prisoner had hold of the woman’s arm. He heard the woman say, “You serve me too bad; you serve me too wicked” I’ll go round with the old woman.” Prisoner answered, “No you won’t.’” He saw them go down the steps towards the towing path. Frank Goodson said he lived at 9, Grosvenor cottages, which was on the opposite side of the river to where the dead body of Mrs Dainton was found. At half-past ten on the night in question witness was about to go to bed, and was partially undressed, when he heard terrible screams of “Murder” by a woman. He immediately came downstairs and went to the wall of the river, which was about six yards distant. He could distinctly see a man and woman struggling on the bank on the other side. Mr Kingslake – What do you mean by struggling? Witness- They were tussling with each other. He could see by the aid of an electric light in the neighbourhood. After they had been struggling for three or four minutes they both went into the water together. He heard a heavy plunge into the water. Witness ran round to the other side, but could see nothing. As he only had his trousers on he immediately came back again, and outside the Green Tree publichouse he met Constable Wyatt. Having put some clothes on witness showed Wyatt the spot where he had heard the plunge, and there they saw the body of Mrs Dainton, whom he knew before she was married. This was about a quarter of an hour after he had seen them struggling. At that point of the river there was a shelving bank, with grass growing on the top. By Mr Duke- The water was shallow at that place. Mr Duke- Was it not your impression that they fell from the bank into the river? The Judge – Do you mean that they fell in accidentally? Witness– I do not say accidentally at all. The Judge – Do you mean that they fell in accidentally, or that the man threw the woman in, or that the woman threw the man in? Witness– I should think the man threw the woman in, because of hearing cries of “Murder” and seeing the struggle. The Judge – Your impression is derived from the words you heard? Edward Stokes, living near the river, also spoke to hearing the screams and seeing the man and woman tussling. He heard the woman say, “Oh Harry ! ; what have I done for this?” The woman was resisting the man. Witness went close to the river, and just at that moment the man and woman fell into the water, the woman undermost. When in the water he heard the woman scream “Murder” three times, and then he saw the man climb up the bank. Cross examined – He could see that the man was forcing the woman into the water. She was trying to get away from him. The man pushed the woman into the water. Frank Jeffries, living in Lower Bristol road, stated that his house was about 20 yards from the river. As he was going to bed, he heard a woman’s voice say, “Oh Harry don’t; I am in the water.” Witness dressed, and went down to the river bank and heard cries of “Murder” coming from the opposite side. The last cry of “Murder” seemed muffled. Witness and another young man jumped into a boat, and rowed across to the spot whence the cries proceeded. When they got to the other side, witness saw a man looking over the wall. The man, who was wearing a bowler hat, immediately disappeared. Charles Ponfield, a letter carrier, having given evidence. P. C. Wyatt proved finding the body of the deceased woman in the water. The woman was lying on her right side, with her arm extended, her shoulder being barely covered with water. He placed the body on the bank and tried to restore life, but without success. There were marks of a severe struggle on the bank, the grass and clay being torn away. Mr Kingslake – When you told him it was his wife, did he make any exclamation? Witness cautioned him, and prisoner then said, “For God’s sake, master, I did not do it.” Prisoner also said, “You know when we had a few words. She threatened to do away with herself.” He repeated that statement several times. At the mortuary prisoner identified his wife. Prisoner’s boots were very wet, and they had clay on the heels and on the sides. When prisoner was brought to the police station witness removed his boots and found on them clay similar to that found on the boots of the deceased. A suit of corduroy clothes, which prisoner admitted wearing on the day in question, was found at the house. The clothes were wet, and there were parts of blades of grass in the trousers where the bottoms had been turned up. There was also mud on the clothes and hat worn by the prisoner similar to that on his boots. A footmark on the bank at the spot indicated corresponded with an impression made by prisoner’s boot. There were indications on the towing path of a person having got out of the water, the ground being wet for about ten yards. Prisoner when charged said he had jumped into the river, as he wanted to do away with himself. By Mr Duke – Prisoner was not taken into custody on the night of the murder; but, on account of the feeling against him by the people of Avon street, he was allowed to sleep at the police station. He examined the prisoner’s clothes but could find no breakages in them. Alfred Dainton, a son of the prisoner, 14 years of age, was next examined. He was a bright little fellow, and gave his evidence in a most intelligent manner. He said that on the night in question, between half-past 10 and 11, he was in company with several other boys at the top of Avon street, when he saw his father going towards home. Water was dropping off his clothes. Witness followed his father and saw him go in to the house. The door was locked, but his father burst it open. Witness looked through the window, and saw prisoner changing his clothes. He saw him take his stockings off. The clothes produced were those his father took off; he was not long changing them, and he left the house wearing a pair of corduroy trousers and a black jacket. By Mr Duke – He guess it was between half-past 10 and 11, because it was some time after he left work, and he left about nine. Mr [sic] Hardwick, wife of the deceased’s brother, of 3, Kingsmead square, said prisoner and his wife lived on very unhappy terms, and she had seen prisoner strike and kick the deceased. About three minutes to eleven on the same night prisoner came into a publichouse where witness was. He was wearing different clothes to those he had on in the morning. Witness asked him what brought him there, and he said, “She is on again, and I have walked away and left her.” He also said he gave her a tap on the nose and she bled like a pig. Sergt. Newton spoke to finding the clothes produced at prisoner’s house. Sergt. Townsend deposed to prisoner saying that he got into the river to do away with himself, as he was tired of life. An ex-sergeant named Flowers said that when charged with the murder prisoner said, “I knew nothing about the drowning until I saw her with the policeman on the ambulance.” He showed witness some clay, which he said he had brought from the place where he worked. It was similar to colour to that on the clothes. Arthur White and William White, the mortuary keepers identified the body. Mr Henry Culliford Hopkins, surgeon, said he made a post-mortem examination of the body of the deceased. The body was well nourished and developed. There was mud on the face, under the nails, and in the hair. There was a recent bruise over the eye. Death was due to drowning. His Lordship – Was there any indication as to whether the drowning was of a voluntary character on the part of the deceased or not? Have you heard the evidence given today? – Yes. Nothing whatever, except a blow on the nose, which might have cause her to faint and fall on her face in the water. There was one over the right eye, which might have caused her to faint, but I do not think it probable. Mr Duke proceeded to call witnesses for the defence. Charles Stainer, a boy, stated that he was with the prisoner’s son, Alfred Dainton, on the night in question on Avon street, and about 20 minutes past ten he saw the prisoner coming down the street. His clothes were dripping wet. Clara Phillips, wife of Joseph Phillips, the landlord of the Lord Nelson, Avon street, stated that the prisoner came into the house, on the night in question, just before eleven o’clock. Mrs Hardwick was there. Witness asked him where he meant, and he described a publichouse near Trim Bridge. She asked him where his wife was then, and he said that when they left the publichouse she slipped him, and that he had not seen her since. Mr George Matthews, prisoner’s employer, stated that the accused bore an excellent character as to his bearing and demeanour towards those about him. Mr Duke then addressed the jury on behalf of the prisoner, and he pointed out that the fate of the accused depended on the view which they took of what occurred on the river bank on the night in question. He contended that the evidence of the three witnesses who had spoken to that part of the case differed in many details, but what was certain was that a man and a woman were tussling upon the bank. He should ask the jury to adopt Goodson’s view of what occurred, rather than that of the other two witnesses, whose statements were inconsistent with their evidence before the magistrates. Goodson’s story had been consistent throughout, and he distinctly stated that the man and the woman fell into the water. If that were so – if in the course of the struggle they fell into the river, and the man (whoever he was) scrambled out forthwith, that did not amount to the crime of which the prisoner was charged with. Even if the jury came to the conclusion that the man was the aggressor and was the person to blame for the fall which resulted in the death of the woman, that at most was an offence of manslaughter, and did not amount to murder. There was, he contended, no ground for saying that the prisoner formed a deep laid plot to take the life of his wife. There was nothing incredible in the prisoner’s statement that, being tired of his troubles at home, he jumped into the river to drown himself, and getting out, he returned home. It might be a tragic coincidence that the prisoner should have attempted to commit suicide on the same night that his wife was drowned. But was he, because it was a startling coincidence, to shrink from the task of dealing with it in order to show that – apart from the fact that his wife had got into the river in a struggle with a man – it was perfectly possible? He urged the jury to believe the prisoner’s statement that he knew nothing of the drowning of his wife until he saw her body in the custody of the police. The jury had to try whether the woman was murdered by her husband. One witness put it to them in a way which showed that at the utmost the offence of the man on the river bank was manslaughter, and not murder. Were they to flout and to set aside that evidence which most favourable to the prisoner? He put it to them that it would be their pleasure, as it was their solemn interest and their sworn duty, as jurymen in that case, to give the prisoner the benefit of that witness’s statement, as well as every doubt which existed in the chain of circumstantial evidence which had been woven against him. At conclusion of counsel’s speech there was an outburst of applause, and his lordship peremptorily ordered the public gallery to be cleared, remarking that he would not allow such conduct in a court of justice. His lordship’s order was promptly carried out. Mr Kingslake then replied on behalf of the prosecution, remarking that all the circumstances of the case pointed in one direction–and that was to the guilt of the prisoner. The judge commenced to sum up at half-past six o’clock, and said the first question for the jury was whether the prosecution had satisfied them that the prisoner was the man struggling with the deceased woman on the bank. He reviewed the evidence at length, and pointed out that the prisoner did not account for how he spent the time which corresponded with the period at which the murder was alleged to have been committed. That the prisoner should have attempted to commit suicide at the very time when another man was getting wet in attempting to drown his wife suggested a tremendous tissue of improbabilities which showed how difficult it was to come to the conclusion that someone other than the prisoner had committed that offence. If, however, the jury had any reasonable doubt upon the matter, the prisoner was entitled to an acquittal; but if they were satisfied by the concurrence of testimony that had been adduced that he did commit the offence – that he being the only person who could be suggested to have had a motive did quarrel with the woman – then came the question as to whether the crime was one of manslaughter or of murder. If he took her to the river bank for the purpose of getting her into the water, and deliberately held her down until she drowned, that was murder; but if in the struggle they fell into the water accidently, and he stumbled out without assisting her, that would amount to manslaughter only, because however morally he might be to blame, yet still a man was not punishable for murder for not doing something that moral duty would prompt him to do. The Judge finished up at ten minutes past seven o’clock. GUILTY, with a recommendation to mercy. His Lordship commented on the nature of the crime of which the prisoner had been found guilty, and sentenced him to death. Prisoner maintained a quiet and solid demeanour throughout the trial and, although closely followed the evidence and the speeches his countenance betrayed not the slightest indication of emotion or agitation.